After achieving South Africa’s best result at the World Half-marathon Championships in more than a decade, the country’s top road runners believe they can improve even further. The men’s trio produced a brave effort in Copenhagen on Saturday, sticking with the lead group for most of the race as they all broke their personal bests. Stephen Mokoka was 12th in 1:00:46, chopping 11 seconds off his career record and setting the fastest 21km time by a South African since Hendrick Ramaala in 2003. “I’m very happy with my time, and if I follow my programme, hopefully in two years’ time I will be much faster,” Mokoka said. Elroy Gelant took 13th position in 1:01:09 and Lusapho April was 15th in 1:01:15, carrying the SA men to fourth place in the team competition – the nation’s best performance in 12 years. “Having experienced guys in the team helped a lot,” Mokoka said. Rene Kalmer struggled in the women’s race, but held on to finish 27th in 1:11:52. “I just felt uncomfortable from the start. It was not the time I was hoping for, but I still had a decent run and it’s my best time in the past two years,” Kalmer said. “I’m happy that I can build on this for the rest of the year, and I’m satisfied with my position because it was the biggest field in history. 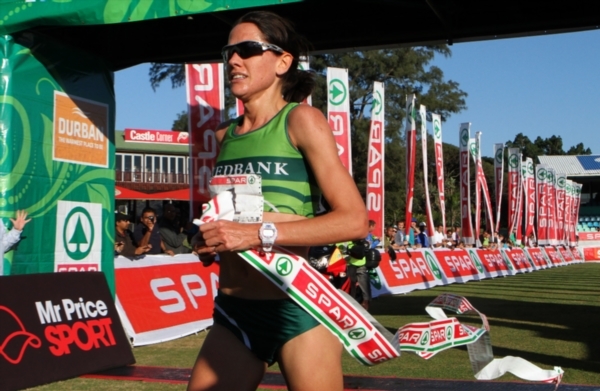 Jenna Challenor improved her personal best by more than two minutes, taking 47th place in 1:14:19, and marathon specialist Cornelia Joubert ended 66th in 1:17:09, as the women grabbed 10th place in the team competition. “I am very, very impressed,” said team manager Colleen McNally.